I've been playing with rye loaf ratios (starter/water/flour) and I came up with one using any amount of rye starter that when refreshed is a paste (100% hydration) and as it ferments loostens to a thick batter. I was looking for basic numbers (like 1/2/3) and I found them they're 1/ 3.5/ 4.16. It makes Rye so much easier! The starter should be generously refreshed 8-12 hours before and mixed into the dough just before peaking and in a 22°c room (72°F) the dough ferments 7-8 hours before baking. Dough should not be folded or shaped 4 hours before going into the oven. Hydration of dough aprox 84%. Handle dough with wet hands and a wet spatula. Combine starter and water then the flour, stir well and let rest covered. Add salt about one hour after mixing and any other ingredients. If room is warmer add salt earlier. Three hours into the ferment lightly fold with wet hands and shape into a smooth ball. Place into a well floured brotform or oiled baking pan. Cover and let rise. Don't let it quite Double for it will if conditions are right. Before placing in the oven, use a wet toothpick and dock the loaf all over to release any large bubbles. Bake in covered dark dish in cold oven Convection 200°C or 390°F (oven can reach 220°C easy with the fan on.) Remove cover after 20 to 25 minutes and rotate loaf. Reduce heat by simply turning off convection and use top & bottom heat at 200°C. Remove when dough center reaches 93°C or 200° F.
All kinds of combinations are possible including addition of soaked & drained seeds and or cooked berries or moist altus and whole or cracked walnuts or a little spoon of honey. How it works: I have 150g rye starter at 100% hydration. I figure for water: 150 x 3.5 gives the water amount or 525g. I figure the flour: 150 x 4.16 gives 624 g Rye flour. For salt: 2% of 700g (624g + aprox. 75g in the starter) makes salt 14g or one level tablespoon of table salt. This amount of dough took 1 1/2 hours to bake and included moist rye altus. 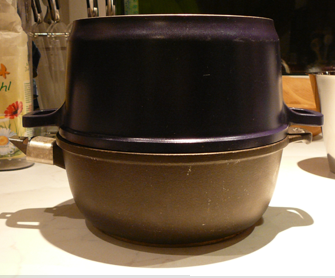 It was baked in two non-stick cast aluminum sauce pans (20cm diameter) one inverted over the other . The rounder of the two on the bottom. No steam other than what was trapped inside. Top removed after 25 minutes. It has a beautiful dark crust with a light shine. Aroma is heavenly. One of the best pure rye bread this century! That is one of the best 100% pure rye bread this century! I shall study all the comments and replies with keen interest. Thank you so much for sharing. Your formula would make a great classic to last to eternity! That's interesting, I study your loaves as well. Time will pass before we see some feed back on the recipe. Not too many out there baking pure ryes. That's truly a loaf for the history books! I'm amazed by the apparent lightness and moistness of your crumb. Obviously you've stumbled upon numbers and ratios that are inextricably linked to the very essence of Nature (and rye). 3. If you graph these numbers, patterns emerge. Therefore: There are patterns everywhere in nature. We all know that a recipe or ratio is not definitive, no golden rule. Most of us tweak recipes. Forget squared pies and just try the ratio. Then you can throw your brick at me if it doesn't turn out! I suppose there could be some formula taking in ash content, moisture, weight, grind of flour, but... my kitchen elves can't read formulas and I see multi-colored graphs in my head. What a combination! They insist the golden rule has something to do with being rewarded for helping me dump ingredients into my dough. I'm mixing up a spelt dough, did a 1-2-3 and it is a little dry. Half the flour was #700 bread flour. Spelt starter too plus half a cube of fresh yeast. It's rising like crazy, going to have to cool it down. We just got dumped with a foot fresh snow, was shoveling out my car and drive and it keeps coming down. I cleared a path for the postman to reach my neighbor. Would have made a path to the WFO if I had one. Anyway, a good time to take in fresh air and bake bread. The trick to a spelt loaf it getting it to come out heavy is to add some yeast, keep it cool for a long fermentation, knocking it down a few times before shaping and a short rise. I've been working on a spelt loaf as a mock rye. I know an Austrian allergic to rye, almost every dark sourdough contains rye here. I found that by using the bread spice and spelt sourdough, soaked rolled spelt and yeast, I come pretty close. I plan to correct that today. I like the smaller diameter pans for more height. Something around 20cm. The right size pan makes all the difference. I am limited in height so will be searching with my trusty tape measure tho I'd envisioned myself with a callipers. I did think of using the glass lid covered with foil, but it proved too awkward for removal with mitts. I gotta get cracking if I want to get a loaf into the oven today before I sleep. I have to build my starter... it's 8am... warm water and more starter to flour, lets see in 6 hours, two tablespoons to make 200ml starter. Where are those elves? I think they must have jet lag too! Last night I managed to sleep the whole night without waking up at 3am! may a pyrex with removable top be a good choice? I never had particularly exciting bakings with glass, but maybe I made some mistake. I wish I still had mine. So fun to watch the dough! I was curious about removing the lid from your bread after 25 minutes starting in a cold oven but I saw a comment about how quickly your oven heats up. do you have any idea how hot your oven is when you remove the top? Maybe in an oven that takes longer to come to full heat the top shoul be removed later. I really like the flavor of rye bread but have a lot of trouble with bread of over 40% rye flour. As the oven was on convection, it heated faster than it would with just upper & lower heat. It was set to 200°c but might have reached 220°c (428°F.) After removing the top, and rotating the form, I turned off the convection which tends to let the oven temperature drop a little. I'm guessing that with the door opening and all, it was around 200°c. The thick cast aluminum pan would be a little warmer and gradually cool down as the crust is browing. "Maybe in an oven that takes longer to come to full heat the top should be removed later." That would make sense. You may have to play around with it a little bit. Adding another ten minutes to the cover time, and browning time is within reason. If you find the loaf near done, but the color too light, simply remove from the pan and set it on the hot rack to bake for 5 to 10 minutes or until nicely browned. After the loaf is cooled down completely, it can be wrapped into a plastic bag allowing the moisture to move from the crumb to the crust (overnight) softening it somewhat before slicing. "I really like the flavor of rye bread but have a lot of trouble with bread of over 40% rye flour." Rye breads over 45% start to take on the dough characteristics of rye which is quite different to wheat. Sticky and not so stretchy. Once over the 50% amount, it is just as easy to go to 60% or 70% treating the dough more like a rye dough and letting the rye work with a sourdough starter thus letting the wheat flour be the added ingredient. It becomes very important not to overknead the dough as the rye amount increases. I like to add the wheat flour right after I add the starter and water when mixing a final dough spending a little time just stirring and letting it sit for the gluten to form before adding the bulk of the rye flour -- sometimes up to 30 minutes later. Just noticed your post, hansjoakim. I LOVED the movie Pi, although I struggle to remember much of it now - quite some years ago when I saw it! It was very much an arthouse release here, and didn't show for long before it disappeared without trace. The few folk I have discussed it with didn't like it much. So, good to see you quoting from the screenplay. Evidently it made an impression on you. Mini, what a crumb! 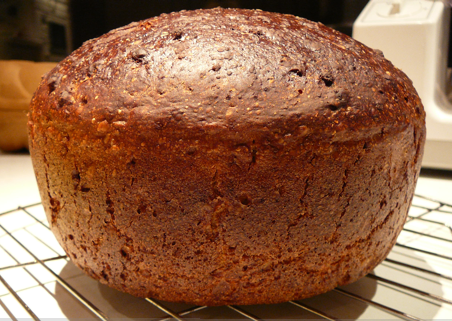 I've steered clear of baking pure rye breads, but this one of yours is irresistible! And to continue on with the application of mathematics to dough mix ratios, this thread reminds me - I've been thinking for a while about how to incorporate Fibonacci numbers into baking. Any ideas? How about applying them to the beasties? That is probably the best place to start. That's 100% rye?! I can't believe the loft. You're brilliant, MiniO! Mini, I love your recap of the Korean oven, too funny. On a sadder note, day before yesterday I received my new Romertopf and I immediately tried it out with your Rye loaf. In my excitement I did not read the instructions to grease down the Topf and everything stuck like mad. The biggest disappointment - the Topf wound up with a hairline crack on the bottom, despite handling that aspect acc to instructions, i.e. soak first, insert into cold oven, pull out and set on something warmish or a folded towel which I did. I can still use the deep top and perhaps use parchment to line it because I feel the soaking properties will be diminished by lathering it with oil. Is there a possibility to get the bottom replaced? I would oil it, I found myself oiling the inside with every second bake. The oil didn't seem to soak into the pot but more staying on the surface. Soaking with water helps distribute the heat in the pot itself. Other than sticking, how did the loaf turn out? Thank you for the link. I'm honored and so happy to see it working in Italian in Italy! Bravo! The alps are not so high after all! I come from a long lineage of bakers, Prussia to be exact, I have a dear love of baking that hs come on stronger since I entered my 40's. I am great at Science, and was an assistant Chef, I am experimenting with Rye, and have thrown 6 bricks away, have 2 loaves of molasses Rye that rose to the heavens, and 2 loaves of light rye that are short but delicious. Now! I have a starter, starting, and it is not rye, it's just AP and filtered water, already bubbling, what that says for my atmosphere I don't know, like I don't know what to do with this once it does whatever it's going to do. I am a serious learner and baker, I have no problem with white breads, and quick breads. I love the doing this, I have one rye rising now, crossing my fingers. I need help on several different levels of several different things, like starters for example, how do you use them with just plain white bread, of the Amish variety, or yeast rolls, or what is the difference between a sourdough starter, what is a rye starter and How do you use a starter, I love the concept and I know it is the bible of baking, will someone please help, there is so much information and as a cook, I am shocked I can't wrap my head around it!! 45 Born in America, Texas to be exact. Could you use some sd basics first? Love your enthusiasm and I hear you! Welcome to the Fresh Loaf! Starters are not the Bible of baking by no means! They are a tool, or more a pool, of growing and dying yeasts and bacteria varieties that we use to raise bread. By introducing them to our dough, the dough starts to decompose and ferment flavoring it as time goes by. We try to control the process and it is slower than just adding packaged yeast but can be worth your time. Sourdoughs, because they tend to break down the gluten structure of the flour as time progresses, have to be handled more gently, no punching of dough, and the use of folding the dough to build surface strength. Sourdoughs generally are heavier than yeasted doughs so I rarely take the "brick" remarks seriously. I just wish I would have seen them. High % Rye is a whole different dimention in mixing & baking, not anywhere near the fluffy cotton candy loaves many of us grew up on. My brother would eat 4-5 slices at a time! You might find our search/index box useful. Type anything that comes to mind and see where it leads you. (avoid single words like flour, starter, suggestion, water or recipe) If you wish to speed up your learning curve, try checking out any of the mentioned books from your local library. If you find interesting threads and want to find them again (sometimes a real challenge) click on the "add to favorites" at the bottom of each introduction article and it will be listed at "My Account" under your name. On the suggested link, here is a well written paragraph under "History" that goes into detail as to why sourdough and rye are ment for each other. Mini, looks fabulous and tasty! If I were to grind the rye myself from rye berries, how would I best approximate this flour? how fine to grind, and do I sift off some bran, or should it be the whole berry. I love 100% ryes! this one looks exceptional. It does and is what I am trying to achieve! I am using Hodges Mill and am tearing my hair out at this point. Don't throw it into the dough! it is probably one of the best I have tasted, won't rise above the bread pan but absolutley delicious, I am not using a starter, don't know how to, have started one though and it smells sour, like sourdough but prefer rye. I feel so lost and I have been baking and cooking all my life. I'll try and post a picture, my profile picture is my molasses rye, that rises to the heavens. The flour is grainy, ash colored, not like the first flour I used which was finer, probably my problem. I want to use starters though and don't know how to, even though there is one sitting on my counter, do I sound panicked, I am. If this were anyone else I would be laughing so you may if you like. Thank you, and I'm smiling, I'm enjoying it only because I've been there. Nothing to get paniked about. Pour youself a cocktail or a beer and let's play with that starter. If it is at least 4 days old and bubbling away (which may be hard for me to believe) reduce it to... wait a minute. Do you know why you want to use a starter with rye? I know my rye flour is very fine, I would increase the water a little bit if you include the bran. If you check the Flour table listed way up on the 960 talk, you might get a better idea. I don't see any reason not to include the bran. If you sift off bran, do you use it to feed the starter? Okay no i am using ap flour to feed the starter, I want to start from the very beginning and do this right, I have uploaded pictures, do I need to make a rye starter? And if so, do I leave the bran in it? And where do I find the recipe for a rye starter and bread? Putting the bran in the starter is a good idea, as it'll have more organisms on it. Good idea. Usually I've just been putting it in my next loaf, or if it's a coarser ground and the siftings have small crumbs of grain I put it on my back deck and the little songbirds on the ground like it. But more for the older ones because it's food! Clasac, how old is the starter? You do not need to make another starter from scratch, you can simply add half AP and rye to this one at the next feeding. The rye is perfect food for a starter, in fact many starters start with rye. It will be no trouble at all. How old is the starter and when did you feed it last? I just dumped it, I want to start fresh, and it was really only 3 days old, and it was bubbling like you wouldn't believe, and smelled to high heaven. So what do I do, and yes I want to make a nice rye, light in color preferred. now go get yourself some unsweetened pineapple juice and make one using rye flour. It is a better way to go. The pineapple lowers the pH in the flour so the stinky stuff you just had is less likely to happen. Mix equal weights rye and juice, cover and let stand. Stir every few hours. I suggest using a cover of plastic wrap and a rubber band for easy access. Don't forget to read some of her other blogs! Question, should I do 1 or 2 cups of each and what will that mean for the finished result. And do I sift the rye first? It has alot of stuff in it. A lot of crushed and whole rye flour is used to feed rye starters. The more unsifted it is, the better your chances of growing a starter. Leave the stuff in. I took the liberty to have your dumped starter picture removed. Hope you don't mind! I'm glad you started anew. It is very pasty, though not dried up, feeding this morning 2T to 2T, very thick, is this okay or do you have more suggestions, I am using the pineapple recipe, it wants my to dump half tomorrow, and boy there isn't much there to dump. I read that and wow, starts with just 2 T of each, I can do that, I want to do it step by step, I will ad-lib when I know the dance floor a little better, you are a doll and I love you already, thank you so much, I will keep you posted. That is quite a spring on the rye! The TFL elves turned your pictures into thumbnails, a much better idea. I was feeling funny about that. Is there a lot of rye in those loves? I went to feed my little pet, named JOBA, and and he is growing fuzz on the side of the jar, it is white fuzz bu it is fuzz, I have a cut zip lock bag over the top with a ponytail holder wrapped around it for the top, it is in a pint mason jar, so is this okay? Beings this is not a chia pet, I didn't think I should have "hair" growing, thoughts? Am I to throw this out> I was getting attached. Fuzz after only one day? Was the jar clean? 75°F temp is just fine for room temp, too warm might get fuzzy. Try adding a spoon more of pineapple juice. Maybe, flour that didn't get mixed in? Sorry I was gone a few days... What's it doing now? I have 2 rye flours one real grainy and one very soft, so can I mix the 2 they are both whole grain. This is a container issue. You might want to add a note to the bag that you added the other to it. As far as feeding starters go they are pretty much equal. I don't normally mix my flours, I'm always looking at the bags for some odd reason. Up to you. Then split it. The few tablespoons you throw away will save you waiting & worry later. This mixture is rather unbalanced in the beginning and better not being saved. I´m Linda, Nico´s friend, and I´m going to do for the second time this wonderful bread. Which is your advice for altus in this bread? I´ve some in the freezer. Is it possible in your opinion to work? And, if I put altus, I´ve to put less flower and water then, to have the same final weight? And in which step I´ve to do this? In the very beginning? Excuse me for the language. I´ll use few words and I hope to understand your replies. I do not figure it into the dough formula for home baking. Weigh the normal frozen bread and use up to 33% of the total weight of the dough. So if you add up all the ingedients and it comes to say 1kg, don't use more than 333g of altus in the recipe. I use less. it can be soaked in the recipe water to soften and put in a mixer. Then the starter and flour is added by hand. or it can be crumbled in the mixer dry. Then mixed into the dough. I prefer this method. I can add little amounts of water if the crumbs seem dry. I pack the dry crumbs into a ball to see how well they stay together, they should be wet enough to just hold together but not soggy. if the altus is dry, it must be soaked and after some time, the old bread is then squeezed to press out the water. That water can be measured and used in the recipe. And, if I put altus, I´ve to put less flower and water then, to have the same final weight? You can do that, but reduce the sourdough starter too. I suggest to start out with a smaller amount of starter for the formula for a small form. Think of adding altus like adding nuts or raisins. Altus from rye bread is preferred. thanks a lot for the info. Sorry for my mistakes.